Ronald Koeman started his regime at Everton with a 1-1 draw with Tottenham. It is not necessarily seen as a bad result given that Tottenham came close to winning the title last season. However, the London outfit made numerous mistakes over the course of 90 minutes and many felt that Everton should have taken advantage. One of the reasons for Everton failing to score more than just one goal was their apprehension towards attacking the opposition with full force. Tottenham are one of the dangerous counter-attacking teams in the Premier League and this could have been a reason behind Everton holding back despite being at home. Koeman acknowledges that the team should have attacked a little more in order to get the second goal, which would have changed the complexion of the game. He has asked his attackers to be more aggressive in coming weeks, but a lot of could depend on the presence of Romelu Lukaku. The Everton record signing was unavailable for the game against Tottenham. Even though there are mounting transfer rumours linking him with a move to Chelsea, it looks like Everton may hold him after all. If they manage to keep him happy, Lukaku could be a major threat after having scored 25 goals in 46 appearances last season. “It's Ross's first goal and this is one of his qualities but what I like from my midfielders and strikers is that they work hard.They need to run more and be more aggressive and then, with their qualities, they will be great players. It starts by working hard and they need to improve in that.The signs are very positive. The performance for 45 minutes was at the level I expect from the team. 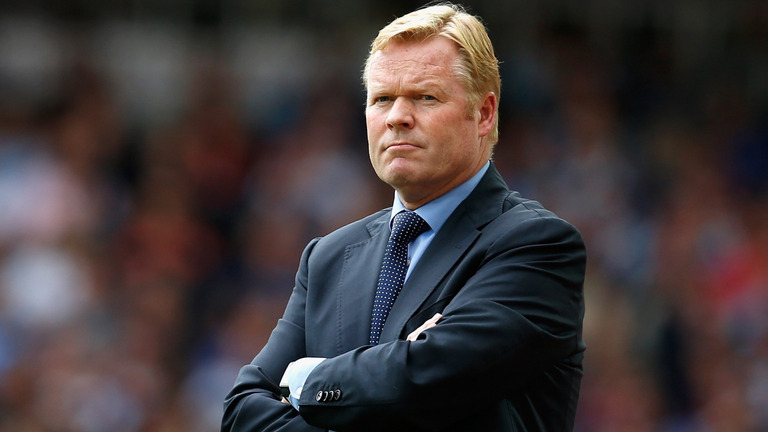 The fans like the energy and it starts with this, not by playing football,” said Koeman.